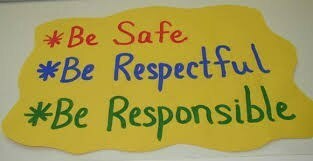 There are three (3) VERY SIMPLE school-wide rules. The following behaviors apply to ALL areas of the school campus and school bus. Walk to the right (like the rules of "driving a car...stay in your lane"
Always report any problems to an adult!